Ripped jeans are in demand now but if you don't choose carefully, you might end up looking unchic. Or worse, shorter. Finding a good pair of ripped jeans is not an easy task for me because I have to think about the aesthetic (for sure) and the comfortness. This distressed boyfriend jeans from Shein.com is currently my favourite piece in my wardrobe. 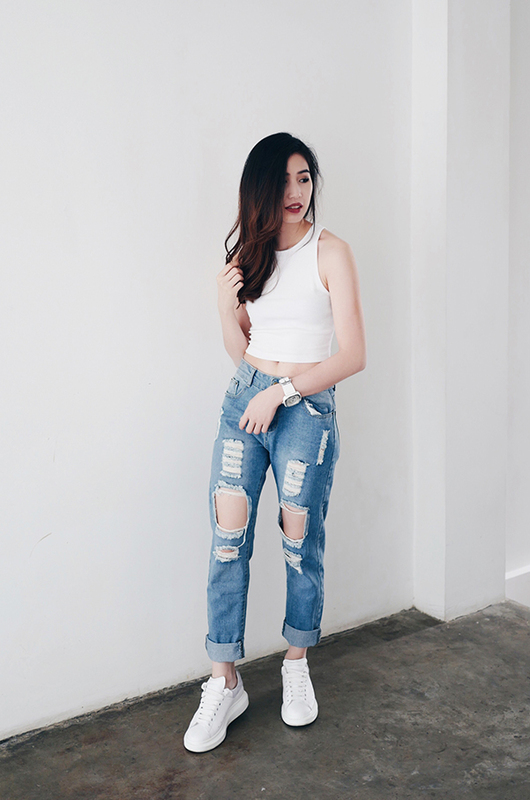 Boyfriend jeans are much more comfortable than skinny jeans personally because of the fitting. However, wearing boyfriend jeans sometimes makes me look shorter because it's more baggy and if it's too distressed then I'll look 'untidy'. I think with this look, I managed to pulled the distressed boyfriend jeans and still look polished and chic. The white crop top is the key to this look since white colour is pure, clean and bright which somehow balance the distressed jeans look. Wearing a white sneakers with a bit of platform helps a lot in creating taller appearance and I really recommend wearing this type of shoes - or heels - when you wear a boyfriend jeans. You can get this jeans at Shein.com! They have so many selections that you can choose from and deliver fast too! this is cool! love your style. btw, I read your blogpost from Indonesian Lifestyle & Fashion Blogger FB group. Have a nice day! Oh my! you're so talented <3<3 suka bangettt. love your blog cii. btw I've follow your blog, follow mine, would you?